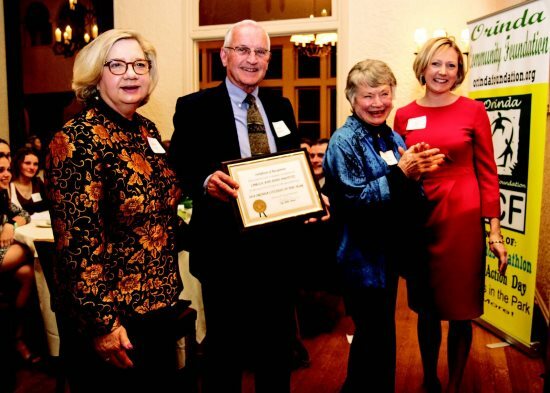 The largest ever gathering for the Orinda Community Foundation/Orinda Association awards for the 2018 Citizen of the Year and the 2018 William Penn Mott Jr. Environmental awards were treated to a special acceptance speech when one of the winners of the Citizen of the Year award, Carole Amstutz, gave an impromptu performance of the song "Magic Penny" by Malvina Reynolds. "Love is something if you give it away . You end up having more," she sang, as she accepted the award with her husband, Andy Amstutz. 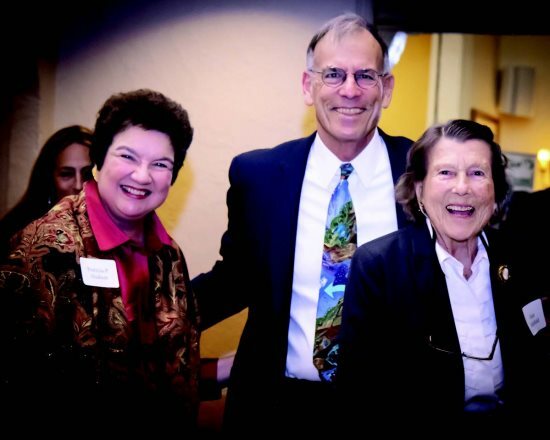 Bill Hudson was honored with the 2018 William Mott Jr. Environmental Award and Andy Radlow and Bobbie Landers were honored with the 2018 Orinda volunteers awards. 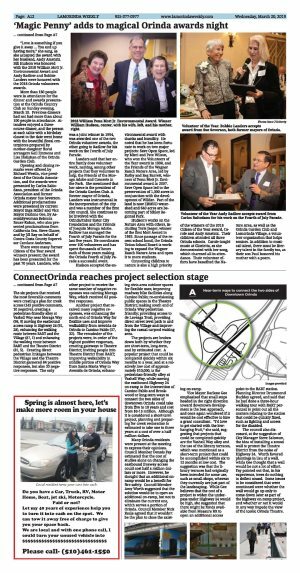 More than 180 people were in attendance for the dinner and awards presentation at the Orinda Country Club on Sunday evening, March 10. Previous dinners had not had more than about 100 people in attendance. 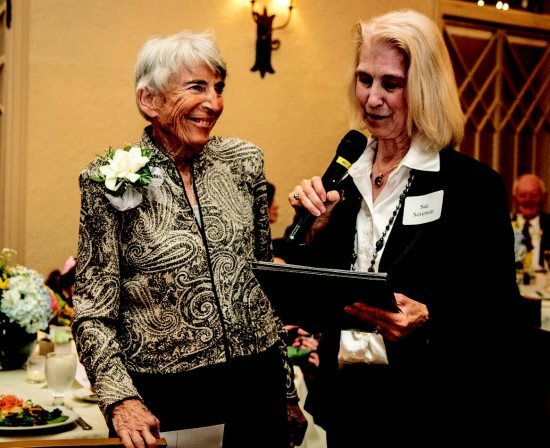 Attendees enjoyed a three-course dinner, and the person at each table with a birthday closest to the date went home with the beautiful floral centerpieces prepared by mother-daughter floral arrangers Gail Emmons and Lisa Hallahan of the Orinda Garden Club. Opening and closing remarks were offered by Richard Westin, vice president of the Orinda Association, and the awards were presented by Carlos Baltodano, president of the Orinda Association and former Orinda mayor Sue Severson. Additional proclamations were presented by current Mayor Inga Miller and Vice Mayor Darlene Gee, by Assemblywoman Rebecca Bauer-Kahan, who also presented proclamations from California Sen. Steve Glazer, and by Jill Ray on behalf of Contra Costa County Supervisor Candace Andersen. There were many former Citizen of the Year award winners present; the award has been presented for the past 70 years. Landers, who was a joint winner in 1994, was awarded one of the two Orinda volunteer awards, the other going to Radlow for his work on the Fourth of July Parade. Landers said that her entire family does volunteer work, naming, among other projects that they volunteer to help, the Friends of the Moraga Adobe and Concerts in the Park. She mentioned that her niece is the president of the Orinda Garden Club. A former mayor of Orinda, Landers was instrumental in the incorporation of the city and was a member of the first city council. She continues to be involved with the Orinda/Tabor Sister City Foundation and the Friends of Joaquin Moraga Adobe. Radlow has managed the Fourth of July Parade for the last five years. He coordinates over 100 volunteers and has spent thousands of hours each of those years making the Orinda Fourth of July Parade a successful event. Hudson accepted the environmental award with thanks and humility. He noted that he has been fortunate to work on two major projects: Save Open Space, led by Mimi and Pete Wilson, who won the Volunteers of the Year award in 1998, and the Friends of the Wagner Ranch Nature Area, led by Kathy and Reg Barrett, winners of Penn Mott Jr. Environmental award in 2007. Save Open Space led to the preservation of 1,300 acres in conjunction with the development of Wilder. Part of the land is now EBMUD watershed and 640 acres are becoming part of Sibley Regional Park. Hudson's works on the Nature Area with others, including Toris Jaeger, winner of the first Mott Award in 1993. Since passage of the recent school bond, the Orinda Union School Board is working to expand the Wagner Ranch Nature Area and open it to more students. Connecting children to nature is also a high priority of the winners of the 2018 Citizen of the Year award, Carole and Andy Amstutz. Their children attended all three Orinda schools. Carole taught music at Glorietta, as she demonstrated with her song, which charmed all in attendance. 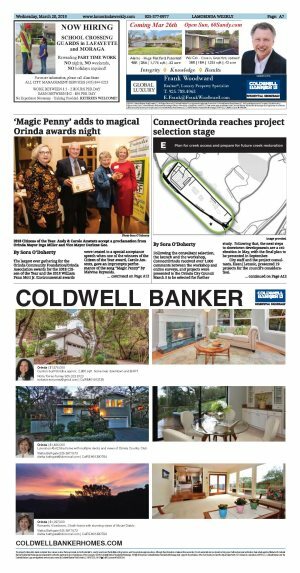 Their volunteer efforts have benefited the Nature Area, as well as the Orinda Garden Club and Lamorinda Village, a volunteer organization that helps seniors. In addition to musical talent, there must be literary talent in the family too, as their son Paul honored his mother with a poem. 2018 William Penn Mott Jr. Envoronmental Award. Winner William Hudson, center, with his wife, left, and his mother, right. Volunteer of the Year. Bobbie Landers accepts award from Sue Severson, both former mayors of Orinda. 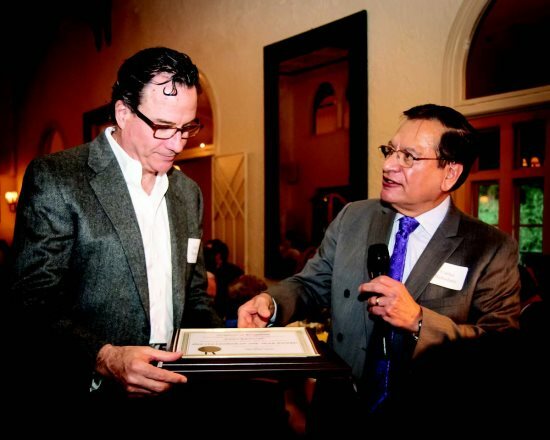 Volunteer of the Year Andy Radlow accepts award from Carlos Baltodano for his work on the Fourth of July Parade.